US stocks soared on Monday as investors turned optimistic ahead of earnings results. 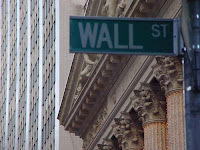 The Dow Jones Industrial Average decreased 25.57 points or 0.32% to finish at 8,057.81. The S&P 500 rose 2.17 points or 0.25% to end at 858.73. The Nasdaq Composite advanced 0.77 points or 0.05% to 1,653.31. After the closing bell on Monday, Goldman Sachs (NYSE: GS) reported a first quarter profit of $1.8 billion, or $3.39 a share, compared to $1.5 billion, or $3.23 a share in the year ago quarter. JPMorgan Chase (NYSE: JPM) and Citigroup (NYSE: C) are scheduled to report on Thursday and Friday, respectively. Shares of US banks skyrocketed. Citigroup soared 76 cents or 25% to close at $3.80. Bank of America (NYSE: BAC) rallied $1.47 or 15.39% to $11.02. American Express (NYSE: AXP) advanced $1.63 or 8.66% to $20.46. Goldman Sachs jumped $5.82 or 4.68% to $130.15 after it said that it has raised around $5.5 billion for a new fund designed to purchase private-equity investments at a discount on the secondary market. General Electric (NYSE: AA) gained 80 cents or 7.06% to $12.13. Energy stocks finished lower. Exxon Mobil (NYSE: XOM) fell $1.82 or 2.61% to $68.02. Chevron Corp. (NYSE: CVX) declined $1.25 or 1.81% to $67.98. Shares of embattled US automaker General Motors Corp. (NYSE: GM) lost 33 cents or 16.18% to $1.71.The New York Times on Sunday reported that U.S. Treasury is directing General Motors Corp. to lay the groundwork for a bankruptcy filing by a June 1 deadline, despite GM's public contention that it could still reorganize outside court. Express Scripts Inc. (NASDAQ: ESRX) announced that it has agreed to buy health insurer WellPoint Inc.'s (NYSE: WLP) pharmaceutical benefit management subsidiaries for just under $4.68 billion. Shares of Express Scripts soared $7.64 or 15.54% to $56.81.Wellpoint added $3.24 or 8.03% to end at $43.58. Seagate Technology (NASDAQ: STX) said Monday that for fiscal third quarter, it expects to report unit shipments of approximately 39 million for the third quarter and revenue of approximately $2.1 billion, exceeding the company's original outlook of $1.6 billion to $2.0 billion. Gross margin is expected to be approximately 7% to 7.5%, which is better than the earlier forecast of the company. Shares of the company slipped 31 cents or 4.66% to $6.34. Tech Mahindra, a joint venture between India's Mahindra Group and U.K.'s BT Group won an auction for a controlling stake in Satyam Computer Services Ltd (NYSE: SAY), the company at the heart of India's largest corporate scandal. Satyam shares plummeted 40 cents or 15.09% to $2.25.